This weekend has been absolutely crazy! The weather was hot (as usual around this time of year), and for some reason, we just could not stay indoors. I feel like we were running around the whole time and that I didn’t get much accomplished. Which is mildly true. I did get a chance to add a couple more inches to the Bias Blanket (by Jennifer Casa) and change colours. I’m working with Simply Soft (we don’t know yet if baby will be allergic, so hopefully acrylic will be okay) in grey and teal. I’m not sure what the colours’ official names are as I’ve already lost the wrappers. 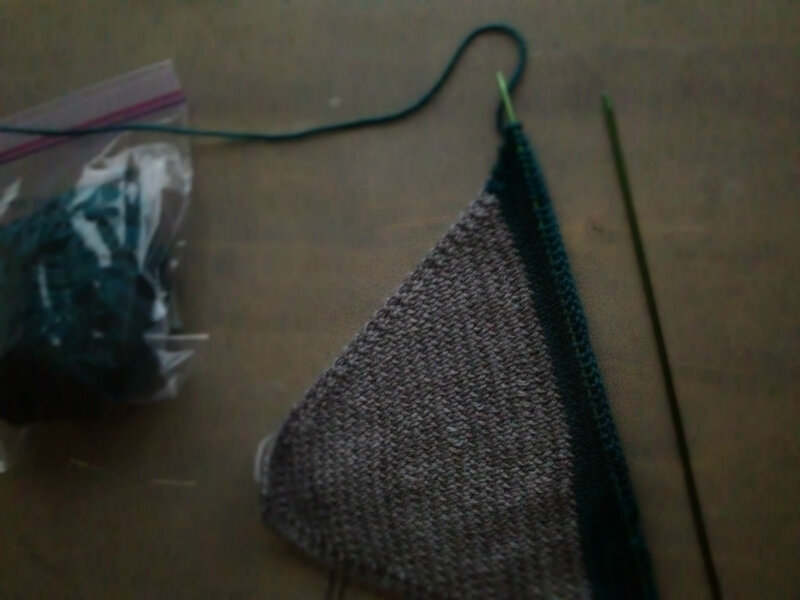 I’m knitting on size 3 needles for a nice, dense fabric. I love the way this is turning out. So far, it works up really quickly. I know that’s only because I have so few stitches still, but it’s nice to see a project really take its shape. I also love not toting around a pattern everywhere I go. I’m not good at memorising patterns, but this has only 2 steps up to the middle and then 2 steps back, for the most part. And the shape! It’s not square or rectangle. It’s, from what I’ve read, more kite-like in shape to better fit around a baby. Fascinating! Today my knitting time gets cut back a little more, at least for 10 weeks. I am taking Fantasy and Science Fiction: The Human Mind, Our Modern World through Coursera. In case you haven’t heard of Coursera yet, it is a free online “university” of sorts. The courses are taught by professors from many top universities around the world, including the University of Edinburgh, Princeton University, MIT, and Stanford University. I’m really excited to get started. I haven’t been to school or class since I graduated from college a couple of years ago. What projects did you work on this weekend? I love the colors for the bias blanket. I agree that it’s nice to have a simple (but different) pattern to work on. I am excited to see more progress and can’t wait to hear more about your course.